The Tataki Hotel is located in the city center of Fira, just 40 meters from the cliff. 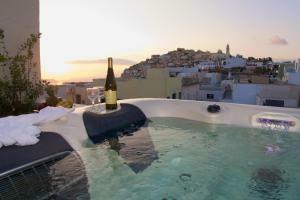 It offers views of the caldera and air-conditioned rooms with free Wi-Fi and balcony or terrace. The Tataki Hotel serves a buffet breakfast. Air-conditioned room with a TV and free Wi-Fi. Room with 1 large bed, sea and boiler views and hot tub. This room is located on the top floor and features a large bed and a large terrace with views of Fira.